Alex Buono, full-time cinematographer of indie films, music videos and at Saturday Night Live, where he has been the Director of Photography for the SNL Film Unit since 1999. He had literally left Los Angeles just a day before, after supervising the edit for the season finale and interviewing writers for season 2 of his newest project, "Documentary Now!". 16 hours later, after a trip to Salt Lake City teaching his all-day workshop Visual Storytelling 2, he was back in the thick of it—again, in LA—now supervising a music session. He'd be there less than 12 hours total before he would be on his way yet again, this time to Seattle teaching another all day filmmaking workshop. To most, that schedule would be paralyzing—both physically and creativity. But to Alex Buono, DP of Saturday Night Live—among many other notable projects—he thrives on it. For good reason too: he's doing what he loves, working for and with people he enjoys, all while lighting a fire under countless up and coming filmmakers to do the same on his educational tour. It's inspiring to say the least. Somewhere between Alex's music supervising session and his trip to Seattle, we caught up with him to chat about his tour, Visual Storytelling 2, and about the secrets to being a successful filmmaker. In true Alex fashion, he was an open book. From where to spend the money on your projects, to landing great jobs, to developing confidence while leaving your ego in check, to being a factory and not a warehouse, we covered a lot of ground in our discussion. Now, in true Story & Heart fashion, we're excited to bring this insight and inspiration to you, our amazing community. Alex Buono: The things that make your work really powerful or really strong, or the things that are going to set you apart in the industry, are not the gear at this point. It's not that you haven't spent enough money yet on your camera package. All these cameras are so good and the lenses are so sharp—that's not the issue. If you have money to spend on something, spend it on the art direction, spend it on your costume department, or take an extra day of shooting so that you can actually slow down and nail the performance before you move on. As a cinematographer you wield so much power and sway, over particularly the director and oftentimes the producers too, you can convince them to spend more money. 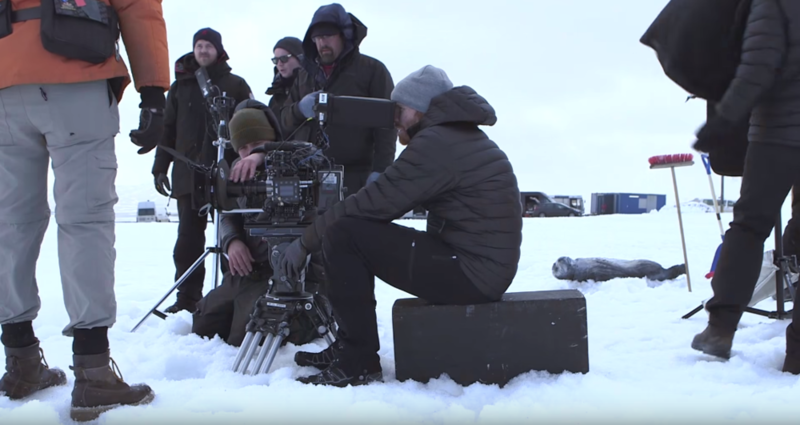 “Oh, you know we need to have these anamorphic lenses," "Oh we have to shoot some other film," "I need a Steadicam," "We should really put him on the end of the crane for this shot.” They're not going to go and raise more money—they're just going to turn around and take money away from the other departments. The irony is that it's the art direction, the costume design, and the hair and makeup design that are going to make your films better. I've made this mistake over and over where I'm insisting on all these toys and then I show up on set and it's like, "Hey, congratulations I have a cream-colored room with a cream-colored sofa and no window dressings and...what am I supposed to do now?" Conversely, if I had just said, “You can have all the money, give me a beautiful set,” I'd go in there with a DSLR and know it's going to look amazing if I turn on that Chinese lantern. 2. Don't make films for the internet. Alex Buono: People ask how I stay inspired when I’m working like a dog on certain projects. One, I work with people that I care about. I've been working with this team at SNL for like 10 years, they're my best friends. I don't do these things to make the internet happy, I do these things to make my friends happy. I want to impress my director Reese, I want to impress my editor Adam. I want Adam to look at this footage and go "Damn man, how'd you do that, that's so cool, this is great, what a pleasure to be cutting this stuff." That makes me feel good because I have a relationship with him. I work with my wife when I'm not at Saturday Night Live. My wife and I, she's a writer and a producer, we make documentaries together. We have no budget, we self-fund most of it, but it's a pleasure to work with somebody who I care about and who is this together with me. Two, I've decided that I'm only going to work on things that I'm passionate about. That's sort of another maybe obvious or trite thing to say. But, I've learned the hard way that if you're not passionate about something, you're not connecting to the material. You're the person on set who everyone is wondering, “Why is this guy here? He clearly is not into this.” It's so hard to make anything, it's so hard to make a bad movie. It's just as hard to make a bad movie as it is to make a good movie. If you're not passionate about something, if you don't really care that it's done the best way, then you really shouldn't do it. That's the only way to do your best work. Alex Buono: I went to film school and graduated with a class of 30 other would-be filmmakers. Most of my class was going to run off and be the next great filmmaker in Hollywood or whatever. There are only a handful of us left in the film business. Most of our class got weeded out because they never figured out how to do a job beneath the job that their dream was. So if they wanted to be directors none of them would ever lower themselves to be an assistant to somebody, or go to be a PA or to go work in development or to be a camera assistant on the set. It only took a couple of years before their parents decided they didn't want to pay for their apartments anymore and they've got to go and find something else to do with their lives because this isn't working out. Those people that just stuck it out and kept doing it are still in the industry today—they just hacked it out for long enough that they figured out what their mistakes were. I think part of it is that when we look at our filmmaking heroes there's a tendency to want to ascribe their talent to just some kind of genius. It's some kind of unknowable, unreproducible genius intellectual thing that I can't really reproduce myself. And if you're not born with it you don't have it. That's not really what's happening. The fact is that most of what we do is craft and you can learn a craft. It's like drawing. I think there's an impression that if you're good at drawing it's just because you know how to draw, and you've just always known how to draw. But drawing is a craft. You can teach yourself how to draw figures and then you can draw figures. There are rules to it and there's a way to learn it. I think most of the aesthetic and technical details about pretty much any filmmaking process can be learned. 4. It's okay to make mistakes. Alex Buono: The thing about confidence is you can almost put your finger on that moment when, “Oh wow, that's when I actually became confident enough to sort of step forward a little more”. I can feel in my own career. But it's one of those things you can't just tell yourself to be. All you can really do is just own your mistakes and say, "I'm going to keep doing this until I understand how to do it. I'm going to keep making mistakes and I'm going to own my mistakes." I've screwed up things that are big—horribly shot footage that had no business being on television, and yet I kept being brought back because I have a good attitude and they like me. That's what it was. That's then one of the big keys to my success at SNL—having the right attitude and not being insecure about making mistakes and then being afraid to go back because, "Aww man, I screwed up, no I don't want to do this anymore, I don't know what I'm doing." That's one of those difficult pieces of advice to give somebody because you can't just advise someone to be more confident. All you can really do is just encourage people to just stay with it—you're going to make it. It's insecurity that holds us back. I feel like I never know what I'm doing. I just get in there and do it. Alex Buono: In my early days I was clearly the guy with the ego on set. I can tell that now I don't have an ego. I think it's a lesson that we all have to learn. Clearly choosing collaboration is a better way to go than stubbornly just insisting that you know what's right. Being an egomaniac is kind of all about insecurity. There are definitely times when you can feel your ego getting involved. I try to be conscious of it and recognize that is this my ego speaking. Is this really is an issue, or is this just me feeling like I want more credit or whatever? Working on SNL is definitely a workplace that requires compromise. You have no time because it's a live show and there's an absolute deadline and they're going to put your stuff on the air no matter what state it's in—it's 11:30, it's going on the air. "Oh you're not done yet? It's going on the air. Oh there's still green screen shots un-composited in the middle of your shot? It's going on the air anyway." It's a very sobering workplace where you realize you cannot put your foot down and say, "No, I'm not done yet." Ultimately the show must go on. It's that classic—almost vaudevillian—appreciation for what this thing we do is, what showbiz is. Showbiz is a show—there's an audience and you've got to get it done. That, to me, is all about suppressing your ego and realizing, even if you're not doing a live show, you're making a short film or whatever you're making. It's something I tell myself all the time. I'm not shooting a shot, I'm shooting a scene. I'm not just making this one scene, I'm making this whole film. For me to let my ego spike and say to everyone that we're not moving on because I'm not happy with this shot—that runs the risk of that one shot ruining the whole scene or the whole scene ruining the whole project. You have to keep the whole thing in mind. You have to try to maintain a perspective of what's the importance of this one thing within the context of everything else. Does it really matter? 6. Be a factory, not a warehouse. Alex Buono: This one actually comes from David Milch who was a TV show creator. He says, "Be a factory, not a warehouse." That just simply means you don't have to hold onto that one idea or that one thing that you did and say, "This is it, this is my masterpiece, this has to be perfect." You are a factory, you just make stuff, and you just keep making stuff. It's a good lesson for writers, but it's also a good lesson for cinematographers and any kind of filmmaker. Don't get lost in your own ego and the insecurity that this thing you're working on is not the most perfect thing ever. Just make it and put it out there. As soon as you put it out there it belongs to the audience and they're going to interpret it, and then you're going to learn from it. Just make something else and make something else until you are getting better. That's the only way you can do it. I have friends who are all kinds of writers, directors, and filmmakers and they act more like a warehouse and they've been warehousing their one masterpiece idea for years. You're like, "Are you done ending that thing yet? Oh, no no, I'm still getting notes and still ..." and you're like,"Dude, the problem is that your film is flawed and it is what it is. And if you keep editing it for 6 more months it's still going to have the same problems." Just finish it and go make something else. Learn from it and then go make something better. That's what I think is encouraging to me— the idea that you've got to keep making things. This is a wonderful job we have. You're not stuck in a rut where you go to the same job every day. Every day is a new challenge or a new film, or somebody's new wedding, or somebody's new corporate video, or somebody's new event or whatever it is. It's basically a new opportunity to fix the mistakes that you've made before. Unlike traditional secrets, these tips are made to share...so spread the word! Share this post on Twitter or Facebook. Have any filmmaking secrets of your own? Spill 'em below and share with the Story & Heart community!